Most frequently asked questions about Locowise. How to delete profiles from your account. Learn how to remove unwanted profiles from your account and free up space for others. Note: If you are using a free trial account, please reach out to our support team via live chat to request a profile deletion. To delete profiles from your account, please follow these steps. Remember, the number of profiles you may remove using this method depends on your subscription plan, but we accommodate unlimited profile deletions if you email us with 30 days prior notice. When deleting a profile, you may lose all historical data associated with the profile. Open the Settings menu by selecting your circular display pic in the top right corner of your screen (you must be logged in). Select "Account" from the dropdown options. Choose "Swap Profiles" from the menu on the left side. Select the profiles you would like to delete from the list of profiles in the box on the left. They will move to the box on the right. 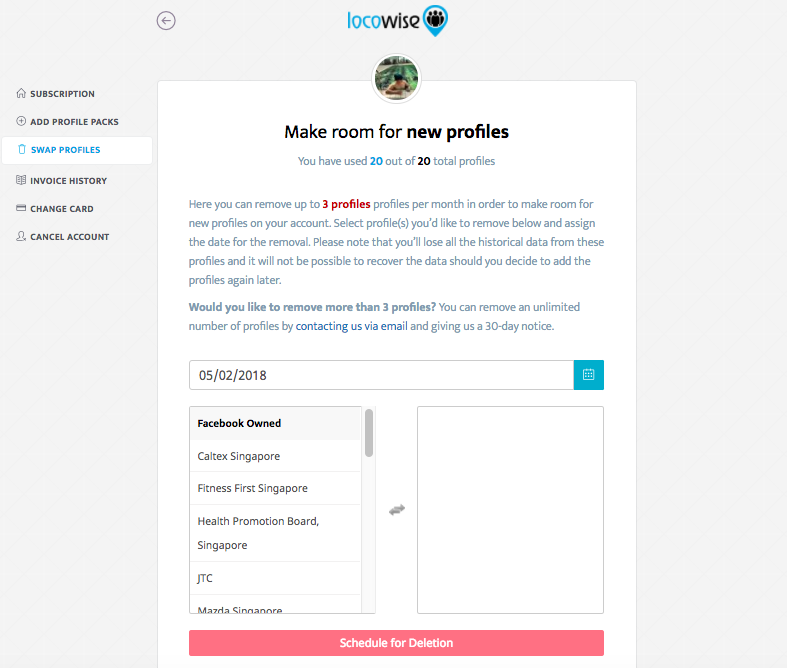 Once you have selected all of the desired profiles, click the "Schedule for Deletion" button.